Welcome to the 1916 Centenary issue of Irish America. This special issue of Irish America is dedicated to the centenary of the 1916 Easter Rising. Its aim is two-fold: to highlight and investigate the key individuals and movements, both American and Irish, who had a hand in the planning, execution, and aftermath of the Rising, and to showcase underrepresented aspects of the Rising, like the role of women, the part the American labor union movement played, and what the Rising meant in the context of the British Empire at the time. 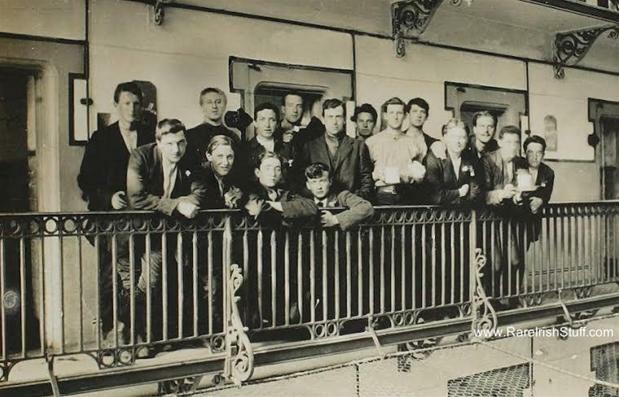 Michael Collins (fifth from right) with other Irish prisoners at Frongoch internment camp in Wales. The legacy of the Rising lies in how it is remembered and commemorated, interrogated and studied. Fifty years ago, for the 1966 anniversary, it was commemorated very differently, as Notre Dame professor Tom Bartlett tells Jason Kelly in this issue, with the emphasis on celebration. “There was no probing questioning, no critical examination, no scrutiny of the revolution’s motives,” he says. Twenty-five years ago, this magazine situated its 75th commemorative issue of the Rising around a discussion of what followed, namely the partition of Ireland and the Troubles, and included one of the first interviews published in the U.S. with Sinn Féin president Gerry Adams. In the years leading up to the centenary, questions again arose of how best to mark its anniversary. In a post-Troubles, still-partitioned Ireland, it’s clear it can not be exclusively heralded, nor can its significance for bringing about the 26-county Republic be under-represented. Into this year, this debate is ongoing, and this issue is a continuation of these inquiries. This special edition is a launch pad for our readers to begin their own investigations into the Rising and it’s legacy – a space to learn new information and a space to raise and posit questions. While editing the articles in this issue, I was struck by two related observations: without the Irish in America the 1916 Rising would not have happened; and Britain sealed its fate by implementing its terror policies, and allowing a famine that forced millions to leave Ireland for America. As far back as pre-Revolution days, the Irish found a home in America. The United Irishmen took their lead from the American Revolution in an early quest for Irish independence, and after the failed rebellion of 1798, many of them settled in the U.S. – including the family of Arthur Schlesinger, Jr. whose story is in this issue. Half a century later, the Great Famine would begin a new phase in the history of the Irish. The flood of immigration from the mid- through the end of the 19th century was so strong that the Irish became a major American presence. By 1860, New York was the largest Irish city in the world. Boston, Philadelphia, Baltimore and other port cities also saw a large influx of Irish. Many of those immigrants would fight in the American Civil War, and some used that experience to inspire another rebellion in Ireland in 1867. When that rebellion also failed, many of the rebels made their way to America where they continued the quest for Ireland’s freedom. After the Civil War, the Irish spread out across the country laying track for the transcontinental railroad, finding employment in expanding industrial cities like Chicago, and passing on the dream of Irish freedom to the next generation. And it was to these Irish Americans that Éamon de Valera turned when he made his almost two-year trip across America (1919-20) and raised $6 million for the fledgling Irish Free State back home. America not only galvanized Ireland’s fight for independence, but also became a protector of Irish heritage and culture. As I researched for this issue, I spent several happy hours at Villanova University’s digital library, lost in time, combing through de Valera papers in the Joseph McGarrity Collection (McGarrity managed de Valera’s tour of America). In the process, I was excited to come across a photograph of McGarrity greeting the Rebel Countess, Constance Markievicz, at Philadelphia’s train station in 1919. The Countess, a major figure in the Rising, and the other women who took part, are especially interesting to me – and there is so much material available online now that wasn’t accessible 25 years ago when we commemorated the 75th Anniversary of the Rising. YouTube especially has a wealth of archival footage. On the site, you can hear Maud Gonne talking about founding the revolutionary women’s group The Daughters of Ireland, and hear Nora Connolly speak of a final visit to her father, James Connolly, the day before he was executed for his part in the rebellion. But as we commemorate 1916, let us not forget the “ghosts of partition,” as Gerry Adams put it in a 1991 interview with this magazine. At the time, the conflict that ultimately took over 3,600 lives was still raging, but Adams spoke to me about it being time for a political solution. It was time for talks, he said, and he called on Irish Americans to get involved. And they did! In the next few years they rallied to the cause of a peaceful settlement to the conflict that had gone on since the partition of Ireland into two territories in 1921. It was amazing for me to witness so much involvement; to see then president Bill Clinton, whose mother was a Cassidy, take up the cause; and others, including Jean Kennedy Smith, who in 1994 helped secure a U.S. visa for Adams, thus enabling him to address the American Irish here, preparing the way for the IRA “complete” ceasefire. I was privy to the often-weekly information sessions put together by the American Committee on American Foreign Policy hosted by Bill Flynn and Tom Moran at the Mutual of America HQ in New York. In this setting, both sides of the Northern divide had an opportunity to air their grievances, and promote a better understanding of the situation on the ground. I also had the opportunity to meet and interview Clinton appointee George Mitchell, who chaired the talks that ultimately led to the Good Friday Agreement (which, like the Rising, also happened at Easter time). That historic document put in place the power-sharing government that successfully, peacefully, presides over Northern Ireland today. I’ll let W.B. Yeats sum up the past 25 years: “All changed, changed utterly!” Change for Ireland would not have happened without America. And the beauty of it is, for all the great change, we are still Irish, as ever, always. Read Arthur Schlesinger, Jr.’s article about the United Irishmen and the 1798 rebellion here. Ireland and the U.S. are now connected through a brand new $300 million transatlantic fiber-optic cable that went live on January 31. Aqua Comms, the Irish based company behind the America Europe Connect (AEConnect) system, put the final splice in the cable in November of last year, making AEConnect the first and only dedicated modern subsea fiber-optic cable system running directly from Ireland to the U.S. The connection runs 3440 miles from Shirley, Long Island, New York, to a station in Killala, Co. Mayo, where it then connects directly to Dublin and then on to London and the rest of Europe. The system has the latest 130Gbps x 100Gbps fiber pair and 52Tbps of capacity, meaning AEConnect can cover all of the European and American data traffic, can handle one third of all telephone calls made worldwide, and should be able to double its capacity within a few years. Though AEConnect is the first and only dedicated modern subsea fiber-optic cable system to run directly from the U.S. to Ireland, it is not the only notable state-of-the-art transatlantic wire connection in Ireland’s history. The first commercially viable transatlantic cable was established in 1866 and ran from Valencia Island, just off the Co. Kerry coast, to a station in Newfoundland, Canada. It was also from Valencia that a leading member of Clan na Gael, (most likely John Devoy) received a cyphered message 50 years later reading “Tom [Clark] Successfully Operated On Today,” signaling the outbreak of the 1916 Easter Rising. Now, 100 years after that, AEConnect allows Ireland and her “exiled children in America” to be even more connected than ever before. Zoe Ireland Drake, the American baby girl born just minutes after landing in Dublin on October 28th, 2015, spent Christmas in Ireland. Her parents, Jenny and Gavin Drake, have remained in Dublin ever since their Nashville-bound American Airlines flight redirected to Dublin when Jenny went into premature labor at 25 weeks. Jenny and Gavin were heading home after enjoying a “babymoon” in Paris when Jenny began to experience pains. She quickly alerted a flight attendant, and shortly thereafter, the plane redirected to Dublin. Jenny considers herself lucky that there happened to be seven or eight doctors on board, but she knew that at 25 weeks, her daughter’s chances would have been extremely slim if she hadn’t made it to the hospital. “My big fear was that if she was born on the plane she wouldn’t make it because she was so young and her lungs were not properly developed,” she said. Only four minutes after arriving at Dublin’s Rotunda Hospital, Zoe was born, weighing just 1.8 pounds. Since then, she has been developing steadily. The couple had initially planned on naming their daughter Elizabeth, but realized they needed to pay homage to the country of her birth. 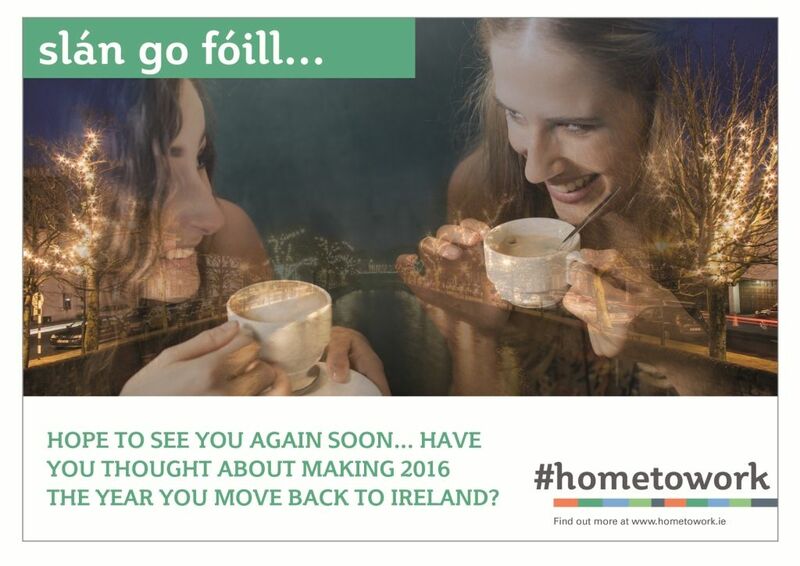 “She had to now be Ireland,” they told the Irish Independent. The Drakes have spent the months since their daughter’s birth in Ireland, and the couple’s three-year-old son, Aidan, who had been staying with his grandparents, joined them in Dublin for Christmas. In mid-2015, a group of fishermen off the coast of Waterford inadvertently picked up what could potentially be Ireland’s oldest archeological artifact. While trawling for scallops off Creaden Head near Woodstown, they also caught a fragment of a flint axe, which they turned over to the Waterford History Group. The Waterford axe may be a similar game-changer, as it could prove that a tribe of people existed in Ireland over one million years ago. Historian Noel McDonagh, who studies flint artifacts of bygone eras, has said that if the Waterford axe is proved to be as old as the Norfolk one, “it would re-write the whole history of early Ireland.” The axe could potentially prove that tribes of people have lived in Ireland since the earliest part of the Paleolithic Era. In addition to rewriting history in Ireland, the Waterford axe could also be among the oldest of its kind found in all of Europe, making it hugely significant internationally, as well as nationally. Ninety-seven-year-old Kerry man John “Jack” Mahony was named a Chevalier de La Légion d’Honneur, France’s highest honor, for his participation in the European theater of World War II. Mahony received his medal and commendation from Phillipe Ray, first counsellor from the French Embassy, in early December at a ceremony in Midleton, Co. Cork, where he and his late wife, Mary, settled in 1973. “In honoring you today, Jack, we honor the bravery, commitment, and strength of all the Irish men and women who stood for liberty, equality, and fraternity alongside France over time and continue to do so,” said Ray. After his family’s London home was bombed by the Germans during the Blitz in 1942, Mahony resigned from the London Metropolitan Police and enlisted in the British Army. After training, he joined the 2nd Seaforth Highlanders and landed on Gold Beach in Normandy on D-Day. He aided in the liberation of the French city of Caen, and, despite being wounded twice in Normandy, went on to the Netherlands to aid airborne units until he was captured by the Germans near Venlo. Mahony spent the remainder of the war in German prisoner-of-war camps. Minister of State for the Diaspora, Jimmy Deenihan, announced the initiative at last year’s Other Voices festival in Dingle in a speech that stressed both the economic and familial. Indeed, the Irish economy is growing, with over 1,000 new jobs being added weekly, and the unemployment rate has dropped below 9% for the first time since 2008. The government plans to have that rate down to 6% by 2020 and to have recovered all jobs lost in the recession by 2018. Economic growth won’t affect just the major cosmopolitan centers, either; a €250 million regional jobs program is also being launched to ensure that all of the country recovers together. November of last year marked the 30th anniversary of the signing of the Anglo-Irish Agreement, which attempted to bring an end to the sectarian violence in Northern Ireland. Signed by then-Taoiseach Garret FitzGerald and Prime Minister Margaret Thatcher, the Agreement gave the Republic of Ireland a consultative role in Northern Ireland’s affairs and offered the possibility of a united Ireland, should a majority of the population wish it. Republicans opposed the Agreement because it forced them to recognize Northern Ireland as part of the U.K., which “copper-fastened partition,” according to Gerry Adams. Ultimately, the Anglo-Irish Agreement did little to quell the Troubles, though it is acknowledged to have paved the way for the eventual Good Friday Agreement. Arlene Foster, the leader of the Democratic Unionist Party, the largest political party in the Northern Ireland Assembly, officially began her tenure as First Minister of Northern Ireland in January, making her the youngest person, at 45, and the first woman to fill that position. Foster has represented Fermanagh and South Tyrone in the Northern Ireland Assembly since 2003, and took over from Peter Robinson as the head of her party after he stepped down in November. Fosters ascension to first minister also comes just before the centenary of the Easter Rising, a point that was not lost on Foster, who in a BBC interview stated that she would not travel to Dublin for the official centenary celebrations and said that it would not be right for her to take part in the commemorations since she believed firmly in democracy and the Union. 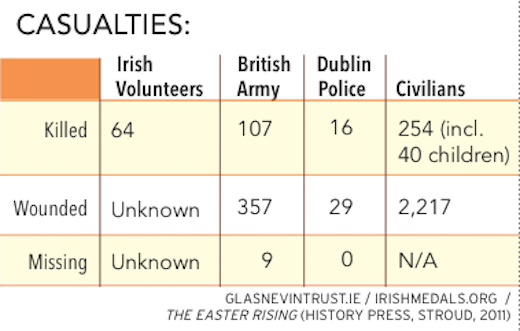 “Easter 1916 was a very violent attack on the state,” said Foster, “and it wasn’t just an attack on the state. It was an attack against democracy at that time.” She also believes the commemorations give succor to violent republicanism. This past November, detectives in County Antrim arrested a former British soldier who was involved in 1972’s Bloody Sunday. The arrest was the first made in connection with the incident, which claimed the lives of 14 civil rights protesters in Derry nearly 44 years ago. The man was arrested and held and questioned at a police station before being released on bail. Since the arrest, there has been a petition for British troops to be exonerated for their actions on Bloody Sunday, as many members of republican groups have been pardoned for crimes committed during the Troubles. The 2010 Saville inquiry, which took 12 years to complete, exonerated the dead and asserted that none of the victims posed a threat to soldiers when they were shot. In 2012, a new investigation into the events was launched, and in the following year, the Ministry of Defense offered the families of the victims £50,000 each. Not one of the families has accepted the money. “It’s the biggest thing to happen since the Saville Report,” said Jean Hegarty of the Free Derry Museum, regarding the arrest. Her brother, Kevin McElhinney, was among the civilians shot dead on Bloody Sunday. He was 17.